I can't believe I just wrote that title, My baby is going to be one in just under two weeks. I feel like I have blinked and this whole year has flew by faster than I can keep up. Emily is quite a easy to please person, she is very independent, and quite happy to take herself off and play by herself with whatever bits and bobs she can find. 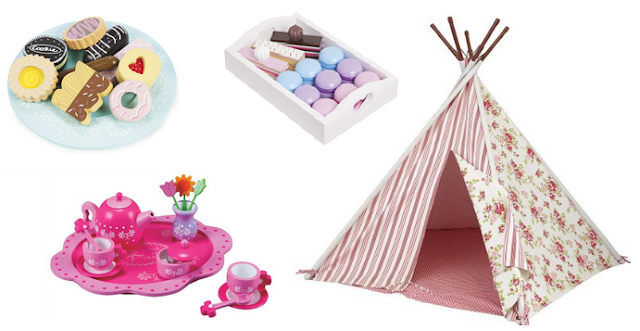 So I have put together a few things for Emily's wishlist. No doubt she will get most of it as we have such a large family. Emily is very girly, anything pink and she absolutely loves it. I fell in love with this floral teepee a while back, and knew Emily would absolutely love it, especially as she loves playing in tents and dens already. Her bedroom has floral accessories so I knew that this would look perfect in there. The tea set and little wooden cake accessories are all to go with the teepee. There is nothing more fun having tea party, Whenever we have been to soft play, or baby groups Emily goes straight for the pretend food. The wooden birthday cake is to go with the above tea set stuff. Emily has always been a fan of the usborne books, she has quite a few different animal ones. When I saw these three I thought they were perfect for her to add to her collection. Emily has quite a few rag dolls that she likes to pull around with her, This gorgeous wooden pram will be perfect for her to put her dolls into and push around. 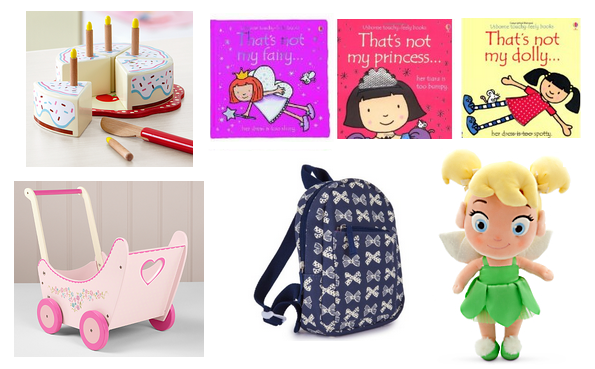 I have also been wanting to get Emily the mini me rucksack to match my one. It is even more adorable than I expected and I know she will love putting her toys in here. She absolutely loves being independent and carrying her own things. Last but not least, this gorgeous toddler Tinkerbell. Emily already has Rapunzel and loves it. So when we went to the Disney store the other day I had to get her another. I originally wanted to get belle or Cinderella, but Emily reached for Tinkbell. So that is what we ended up purchasing. The Scuttlebug seems to be a pretty popular thing recently. One of Emily's friends has one and was really interested in it, so I wanted to get Little E her own. I hope that she enjoys playing in it. Emily has three Toot Toot driver toys already, and she absolutely loves pushing them around. 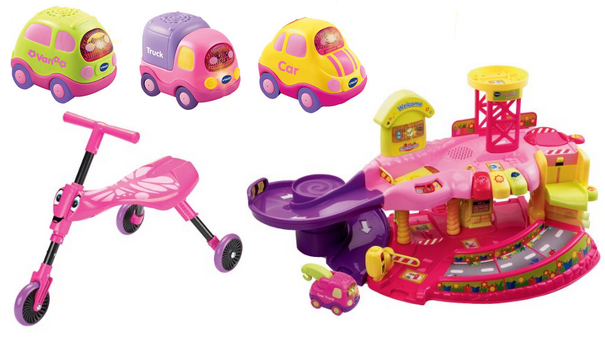 In toys r us they have this pack of 3 toot toot drivers in pink, which I know she will love. I went to look for the garage to get her, and found they sold it in pink. Bizarrely the pink version is £15 cheaper, so pink it was. Although I know Emily will approve as she is pink crazy after all.